In a new working paper, Robert Shiller writes about the importance of narratives. He argues that economists should try to understand what the stories are that people tell each other and this influences decisions. Initially, almost everybody is susceptible. Then more and more people become infected as susceptibles become affected when they meet an infective with a fixed probability (). 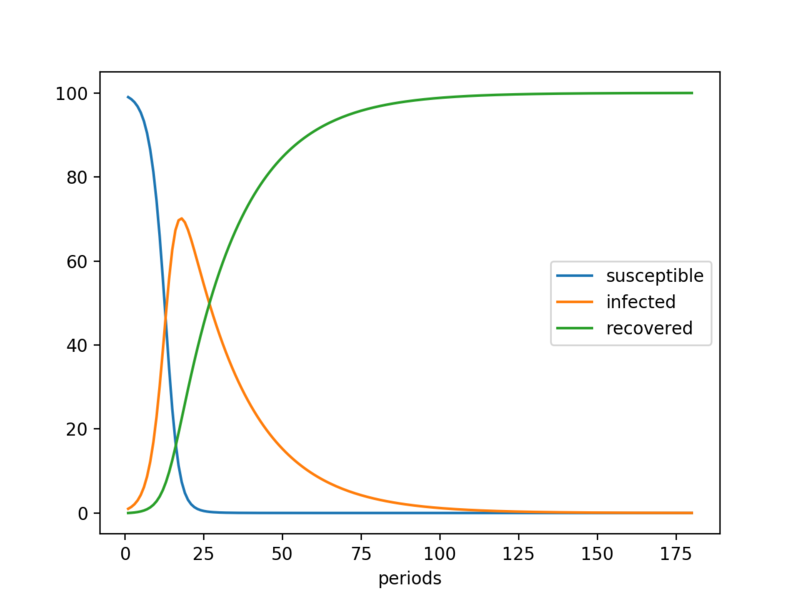 However, a fixed share () of the infected recover permanently every period. The share of infected people peaks when there’s a large number of infected people around, but also a large enough share of people who have not yet had the disease. After that, slowly everybody gets infected, then recovers and the disease dies out. Bartholomew (1982) argued that when variations of the Kermack-McKendrick model are applied to the spread of ideas, we should not assume that ceasing to infect others and forgetting are the same thing. Human behavior might be influenced by an old idea not talked about much but still remembered. This has been called “behavioral residue” (Berger, 2013).